Armenia’s rail network is no longer what it used to be in Soviet times, closed borders having put an end to most international services. However, there is still a handful of routes in operation that may be of use to cyclists who want to begin a ride from somewhere other than Yerevan. They may not be as fast or frequent, but they’re generally more comfortable and practical for the cyclist than buses, and often cheaper too. There is no extra charge for taking a bicycle on any of these services, nor any dedicated bicycle storage on the trains; simply talk nicely to the train staff and they will help you find a place to put your bike. Another general note is that all tickets are one-way; there is no such thing as a return ticket. Timetables are of course subject to change, so we recommend you double-check the information below by calling 184 from any Armenian phone number to reach the railway service information hotline – English and Russian are spoken – or visiting the website of South Caucasus Railways. If you’re considering one of our suggested bike routes around Lake Sevan, you’ll be interested to know that there’s a little-known daily train service that will make getting to the starting point a whole lot easier! The train is formed of just two wagons with wooden bench seating, and runs from mid-June until the end of September. Catch it at 08:30 from Almast station or at 08:41 from Kanaker station, both of which are in the northern suburbs of Yerevan. You’ll arrives at Sevan peninsular – the most popular destination for local families on a day out to the lake – at around 10:45, costing AMD 600 one way. The return journey departs the peninsular at about 17:45 and Sevan town at 18:00, and arrives back in Yerevan at 19:50 (Kanaker) and 20:00 (Almast). Tickets are bought at the departure station, or on board. Top tip: On Fridays, Saturdays and Sundays the route is extended to Shorzha on the eastern side of the lake, arriving at 11:30 and costing AMD 1000. The return service departs at 17:00. 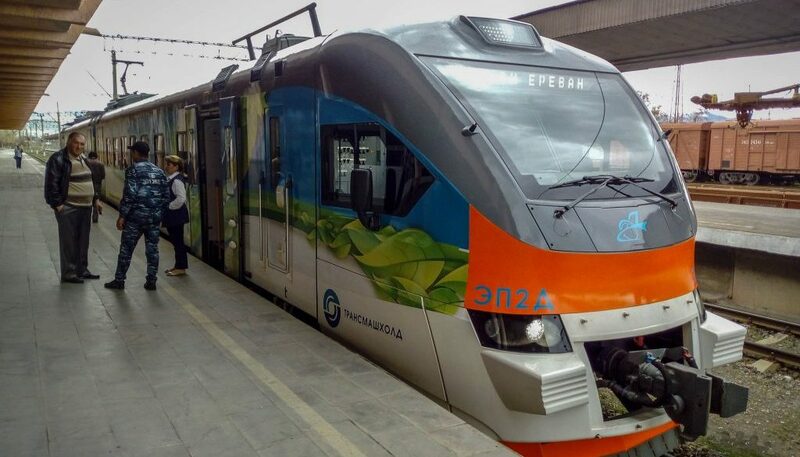 Outside of this summer season, the train only runs as far as Hrazdan – still a useful distance from Yerevan for the cyclist, and eliminating much of the 1km vertical climb out of the city. There’s plenty of space for bikes at the end of each wagon, and bicycles can be taken on board fully assembled. The current timetable for the Yerevan–Sevan–Shorzha train is here. Gyumri, Armenia’s second biggest city, is the starting point for many good bike rides in the north of the country. From Yerevan, Gyumri station is well-served by trains running all year round, with three daily stopping services in each direction and an additional express service at weekends – all of which will carry your bicycle. The ‘slow’ trains depart Yerevan’s main railway station next to Sasuntsi David Square at 07:55, 14:25 and 18:25, arriving in Gyumri just over three hours later and stopping at numerous small stations on the way. The return services depart Gyumri at 08:25, 11:45 and 18:15. Tickets cost AMD 1,000 one-way. Introduced in 2018, a new ‘express’ service runs on Fridays, Saturdays and Sundays in addition to the trains above, departing Yerevan’s main railway station at 10:00 and arriving at 12:10. The return service departs Gyumri at 17:10 and reaches Yerevan at 19:20. This service doesn’t stop anywhere along the way. It’s considerably more expensive at AMD 2,500 (about $5.20) but is air-conditioned and has free Wi-Fi. The current timetable for the regular Yerevan–Gyumri train is here and the express train here. Buy your tickets from the station on the day of departure. 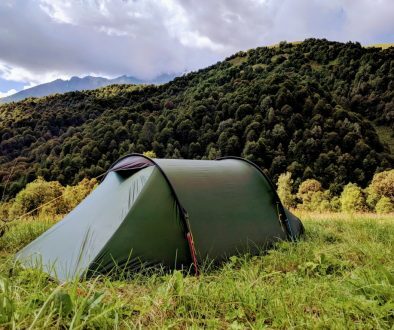 If you need to transport yourself and your bicycle between the Armenian and Georgian capitals, you will be pleased to know that the Yerevan–Tbilisi sleeper train is a viable alternative to the hair-raising minibus ride. Outside of the summer holiday season, the train runs on alternate days in each direction. In holiday season (usually mid-June to late September) it runs daily and continues to the Black Sea resort town of Batumi. Schedules change annually (with a general trend of the journey getting shorter), but at the time of writing the train departed Yerevan’s main railway station at 15:30 and arrived in Tbilisi at the slightly unfortunate hour of 00:45, reaching Batumi at 07:10. In the other direction the train departed Batumi at 15:40, picking up passengers in Tbilisi at 21:45 (the train rests here for 30 minutes) and reaching Yerevan at 07:25 the next day. Timings for the off-season service between Yerevan and Tbilisi tend to be later, with evening departures timed for morning arrivals. Top tip: With its slightly more convenient timings, the Yerevan–Batumi train can also be used to reach domestic stations in the north of Armenia, including Vanadzor (arrives 19:29) and Alaverdi (actually Sanahin; arrives 20:39). There is a choice of classes and fares, from regular seats (the cheapest option) to 3rd class sleeper wagons (platzkart), 2nd class sleepers (coupe) and 1st class sleepers (lux). We’ve had the most luck with 3rd class sleeper tickets, as there’s a bit more flexibility in where you can stash your bicycle and luggage. 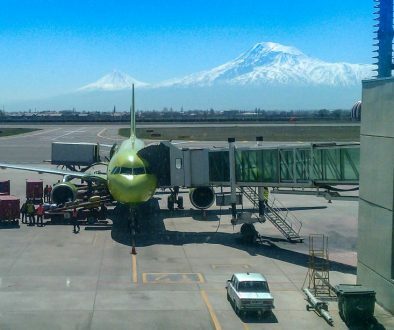 Prices vary along with the schedules, but expect to pay AMD 7,000–20,000 between Yerevan and Tbilisi depending on ticket class, or AMD 10,000–30,000 for the full route between Yerevan and Batumi. Tickets are best bought at least 24 hours in advance from the station of departure – ideally further ahead in peak holiday season. It’s best to take all your food for the journey with you, as catering services are somewhat limited. Additionally, don’t expect an uninterrupted night’s sleep – you’ll be awoken in the early hours for your passport to be checked at the border. We’ve had varied experiences taking bikes on these services. In the summer, the trains may have dedicated luggage wagons, in which case it’s as easy as wheeling your bike on board. 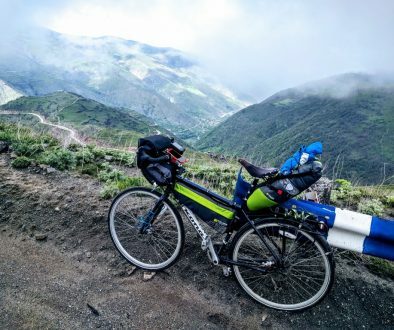 More likely for overnight journeys is that the staff will ask you to disassemble your bike so it fits on the overhead shelves in the sleeper wagons (we found it easiest to box our bikes as well in this case). As everywhere, our advice is to remain patient and good-humoured; the staff and fellow passengers will usually be more than happy to help you. Timetables and information for the Yerevan–Tbilisi–Batumi service are here. When this summer service isn’t running, the timetable for the Yerevan–Tbilisi service on alternate days is here. Do share your experience of taking bikes on trains in Armenia in the comments below!